This chapter turns its attention toward the local (micro) context of the hidden injuries of class (Sennett and Cobb. The Hidden Injuries of Class. New York: Vintage Books, 1972). What about the local area and the families who lived there sets the stage for some to live in “worlds of pain”? 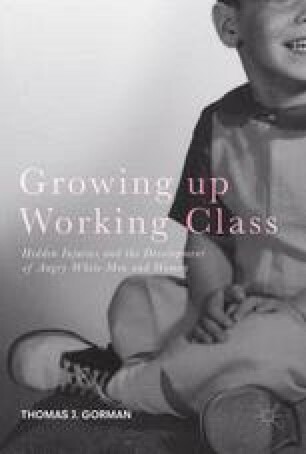 In this chapter I examine the micro aspects of class-related injuries of youth: an alcoholic father and other family problems that are unseen; ethnic identity; rampant sexism and racism; the moms’ and dads’ jobs (and their ability—at that unique time period—to provide blue-collar workers without a college degree with a decent lifestyle); and the stoops, blocks, main avenues, bars, and overall urban village environment.